It feels like everyone in the fashion industry is talking about Marine Serre and her eponymous label, but who is she? The 26-year-old designer not only has an impressive background, which includes past internships at Alexander McQueen and Maison Margiela, but also has managed to become one of the hottest designers of the year with her avant-garde designs, upcycled fabrics, and unique take on sportswear. She was the winner of the 2017 LVMH Prize, one of the most prestigious awards for young designers, which launched her into stardom. Since then, a number of celebrities have been spotted wearing her pieces, including Kendall Jenner, Dua Lipa, and Jennie from the K-Pop band BLACKPINK. Although her brand is very young, Serre has already established a signature motif: the crescent moon. The symbol shows up on many of her pieces; some just have a single moon while others have an all-over print. This symbolism has helped the designer establish her brand’s identity, which is especially important for younger labels. It’s more than just a logo, however; the moon shows up frequently in Islamic art. Marine Serre AW18. Image via. Her most recent collection, which was also her second runway show, was presented during the SS19 season. 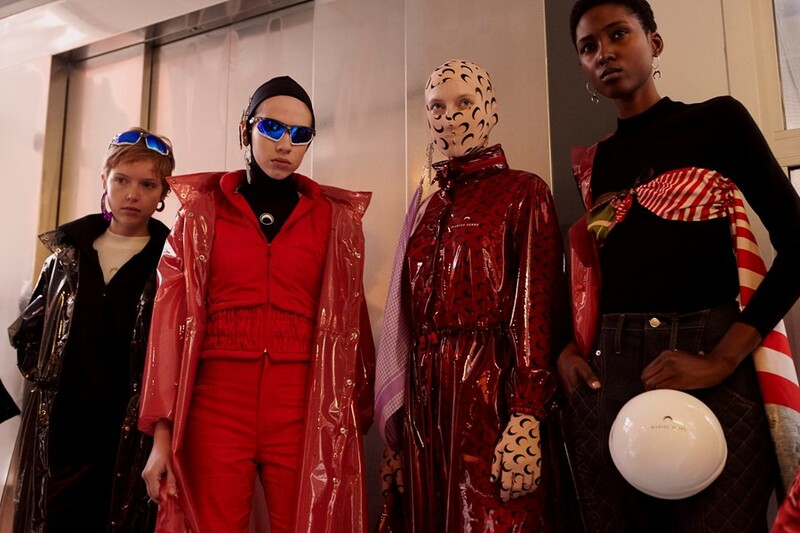 Serre introduced menswear and childrenswear this time around and included elements both old and new; while she kept her signature moon and spherical bags, she introduced new prints and silhouettes, showing the range of her design abilities. Many racing-inspired garments went down the catwalk as well, along with more “FutureWear,” which are the label’s more utilitarian pieces. FutureWear is meant to provide solutions for both the fashion industry and the wearer, and it represents Serre’s commitment to sustainability and practicality. Marine Serre is still a young brand that is guaranteed to only get more popular in the coming seasons. You can check out their Instagram at @marineserre_official and shop the collections on Ssense and MatchesFashion. Runway images via Vogue Runway. Feature image via.